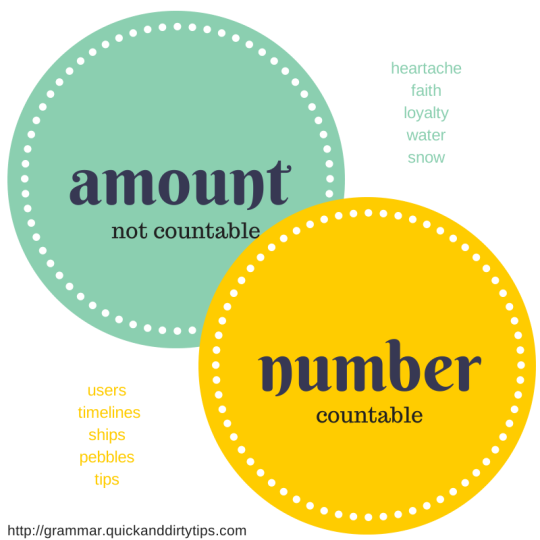 Lots of people we know don’t care about the difference between “amount of” and “number of”—and they use the two interchangeably. And while we concede that it doesn’t really matter in colloquial (i.e., spoken English), we would be remiss if we didn’t make it known that there are lots of other people who insist on the difference. Relevant to our interests, both the SAT and ACT (the two college-entrance exams in the United States) test this. Is it just me, or is the amount of air in this room decreasing? The amount of work it takes to succeed can be daunting. The number of chairs in this tiny room is excessively high. The number of white cars we sold this month was higher than we anticipated. For A number of (something) vs. THE number of (something), read this really simple explanation.